Are you easy prey for false prophets? The following post was first published on my blog on August 23, 2013. With the rise of men and women calling themselves prophets, many people need to hear its warning more than ever. The Bible is clear: false prophets are wolves that devour unsuspecting sheep. 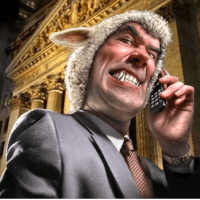 “Beware of false prophets, who come to you in sheep’s clothing but inwardly are ravenous wolves.” (Matthew 7:15) And the apostle Paul had this to say about false teachers. “I know that after my departure fierce wolves will come in among you, not sparing the flock; and from among your own selves will arise men speaking twisted things, to draw away the disciples after them.” (Acts 20:29-30). The answer is yes if any of the following statements–drawn from Scripture–describe you. You think God won’t allow you to be deceived. I’ve often heard it said, by people in the New Apostolic Reformation movement, that we should not worry about false prophets because God will not allow His people to be deceived. But if you believe you can’t be deceived, then you are ignoring numerous warnings in Scripture about the need to guard against false prophets and false teachers (Matthew 7:15; Acts 20:29-30; 2 Peter 2:1).